I feel I have just got over the Christmas cooking and eating and now New Year’s Eve presents itself. Whilst I realise the dates remain the same year in year out, it can take me by surprise. Perhaps because of the way days drift into one another and we seem to be asking ourselves is it Monday or Tuesday. Thus, if you are like me you may need a last minute pudding up your sleeve and this could be it. A rich, elegant and delicious pud, a perfect way to finish dinner, not just at the end of the year but anytime – special enough for a treat but not fussy or frilly. The little black dress of puddings if you will. You can make this today and it will still be fabulous in a couple of days if you wrap it in foil and keep in a cool place, not hard at this time of year. 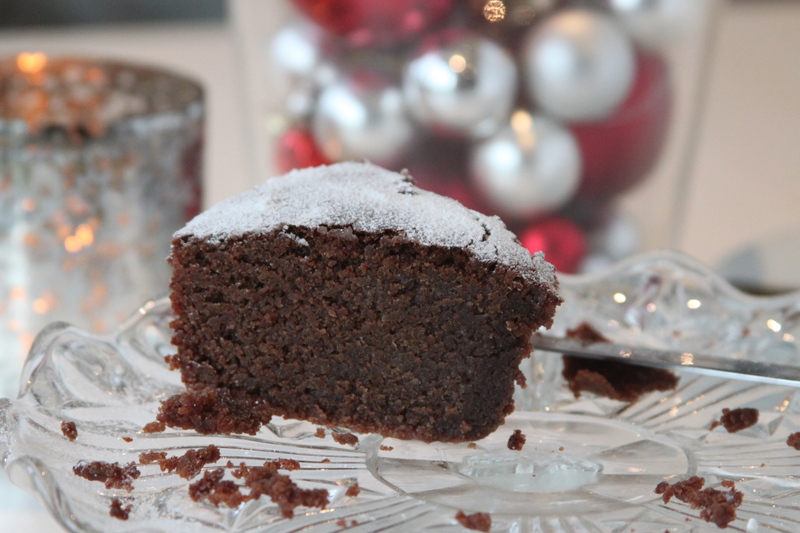 In fact the cake you see in the photograph was one I made before Christmas and froze – it was just as good as if made on the day. We had it with cold double cream but whipped would be lovely too, or creme fraiche if you prefer. Preheat the oven to 160. Butter and base line with parchment a 20cm cake tin. Melt the chocolate in a bowl over simmering water. Meanwhile, whizz the sugar and butter together in a processor, add the eggs one at a time and the ground almonds. Finally add the melted chocolate and stir to combine. Pour the mixture into the prepared tin and bake for 45 minutes. Leave to cool and peel the paper off bottom before putting onto a serving plate and dusting with icing sugar if you want. Serves 8. Could this be the Christmas Cocktail? After the picture above was taken the glass had to be almost prized from my hand such is my delight in the Sloe Vespa. 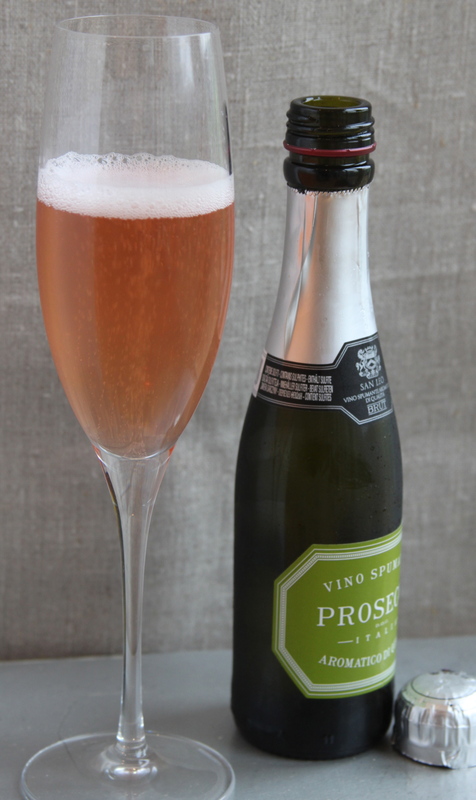 Should you be in possession of a bottle of sloe gin then you are half way to this delicious cocktail which is simply a dash of that topped up with super chilled prosecco. It is the perfect drop to sip anytime it is cold outside and the fire is lit and is also a marvellous Christmas drink. I found the sweet little quarter bottle of Prosecco in Waitrose and it makes two glasses of roughly the amount you see above. What with all the shopping, wrapping and cooking to be done over the weeks ahead, I think a glass of this could be Santa’s little helper…..
Now for a non-alcoholic but just as delicious number. Equally at home every day or sparkling at a party – a Pomegranate Fizz. This is deeply lemony and tangy with a slight floral air about it. Better than I make it sound, very drinkable and absolutely worth a try. Pour a small amount of pomegranate molasses into a tumbler and add a little sparkling water. Give it a good stir, the PM is quite treacly in texture and this mixing incorporates it with the water. Top up the glass with more sparkling, some ice and if you are feeling particularly festive you could add a few pomegranate seeds or better still, put them with the water in the ice trays before freezing.